Set out the timbers on the flat roof leaving a hole where the roof lantern will be fitted and allowing enough room for spotlights if required. Screw a timber down around the hole Approx 100mm high and 70 mm wide making sure the size of the hole does not change. 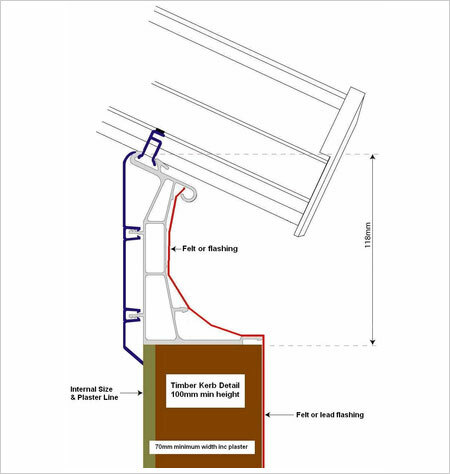 Measure the timber to timber hole and deduct 30 mm from the length and width this will make the roof lantern overhang inside 15 mm all the way around to allow room for plaster work (see diagram). If the hole has already been done and plastered then you would measure plaster to plaster and no deduction is made. If you purchase a roof lantern before you have done the timber to timber hole then you would make the timber to timber hole 30 mm bigger both ways than the roof lantern you have purchased. Plaster to plaster size 2000mm x 1000mm = roof lantern size 2000mm x 1000mm. Timber to timber size 2000mm x 1000mm = roof lantern size 1970mm x 970mm. If you have purchased a 2000mm x 1000mm roof lantern before you have done the timber to timber hole, the timber to timber hole size would need to be 2030mm x 1030mm.